The heart muscle requires a constant supply of oxygen-rich blood to nourish it. 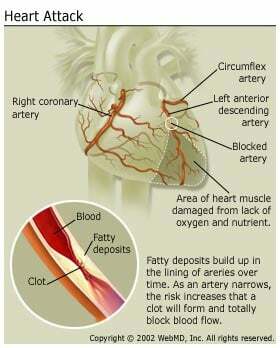 The coronary arteries provide the heart with this critical blood supply. If you have coronary artery disease , those arteries become narrow and blood cannot flow as well as it should. Fatty matter, calcium, proteins and inflammatory cells build up within the arteries to form plaques of different sizes. The plaque deposits are hard on the outside and soft and mushy on the inside. While it is unusual, a heart attack can also be caused by a spasm of a coronary artery. During coronary spasm, the coronary arteries restrict or spasm on and off, reducing blood supply to the heart muscle (ischemia). It may occur at rest and can even occur in people without significant coronary artery disease . Blood tests. Blood may be drawn to measure levels of cardiac enzymes in the blood that indicate heart muscle damage. These enzymes are normally found inside the cells of your heart and are needed for their function. When your heart muscle cells are injured, their contents -- including the enzymes -- are released into your bloodstream. By measuring the levels of these enzymes, the doctor can determine the size of the heart attack and approximately when the heart attack started. Troponin levels will also be measured. Troponins are proteins found inside of heart cells that are released when they are damaged by ischemia. Troponins can detect very small heart attacks as well as those that occurred more than a day after symptoms ensued. Other drugs, given during or after a heart attack, lessen your heart's work, improve the functioning of the heart, widen or dilate your blood vessels, decrease your pain and guard against any life-threatening heart rhythms . During or shortly after a heart attack, you may go to the cardiac catheterization laboratory for direct evaluation of the status of your heart, arteries and the amount of heart damage. In some cases, procedures (such as angioplasty or stents ) are used to open up your narrowed or blocked arteries. These procedures may be combined with thrombolytic therapy (drug treatments) to open up the narrowed arteries, as well as to break up any clots that are blocking them. Other medications may be prescribed if needed. These include medications to treat irregular heartbeats, lower blood pressure, control angina and treat heart failure . It is important to know the names of your medications , what they are used for and how often and at what times you need to take them. Your doctor or nurse should review your medications with you. Keep a list of your medications and bring them to each of your doctor visits. If you have questions about your medications, ask your doctor or pharmacist. There is no cure for coronary artery disease . In order to prevent the progression of this disease, you must follow your doctor's advice and make necessary lifestyle changes. You can stop smoking , lower your blood cholesterol , control your diabetes and high blood pressure , follow an exercise plan , lose weight, and control stress .